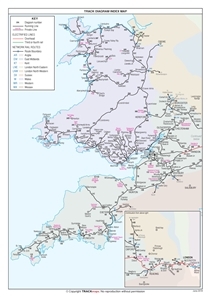 Book 3 – Western & Wales covers the network from London Paddington into South Wales and the West Country plus the lines in Central and North Wales previously in Book 4. For the first time, it also includes the Crossrail Central Core through London. A number of Heritage and narrow gauge lines also appear. Please note: It no longer includes connecting lines into other regions such as the Chiltern lines to Banbury and the Southern lines to Yeovil that appeared in previous editions.